With careful thought, and backed with full supporting evidence, I sent the following letter of the 2nd February 2016 to support my petition for a Sunshine Act for Scotland. The Senior Clerk of the Parliamentary Committee was of the view that this letter did not comply with the Scottish Parliament’s policy on the treatment of written evidence. I was therefore asked to redact significant sections of the letter. the evidence that I have repeatedly been asked for. I realise that the Committee must receive a great amount of correspondence however I hope that the committee might agree that what follows is extremely important when considering PE1493. Since I last wrote to the committee I attended, for accredited continuing medical education, the Royal College of Psychiatrists in Scotland Winter Meeting held on the 29th January 2016. It is this that has compelled me to write this update as it demonstrates beyond doubt that lack of transparency around financial conflicts of interest remains a serious issue. An issue with implications for both patient safety and healthcare budgets. It also demonstrates that Government action is the only way to address this. for members of the Royal College of Psychiatrists. and not just to members. 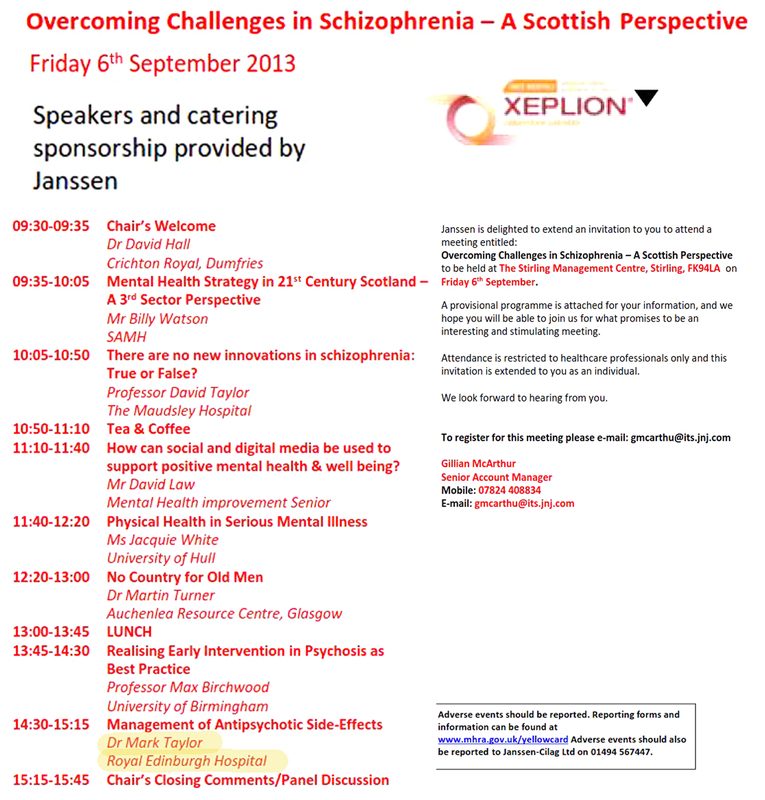 I have highlighted one of the paid speakers, Dr Mark Taylor, because he also spoke at this week’s meeting where he reminded us that he was Chair of SIGN Guideline 131: The Management of Schizophrenia, which was published in March 2013. At this week’s meeting Dr Taylor presented his declarations as follows: “Fees/hospitality: Lundbeck; Janssen, Otsuka; Roche; Sunovion”. Dr Taylor commented on these declarations with the statement that “you are either abstinent or promiscuous when it comes to industry. Well you can see which side I am on”. Audience laughter followed. 2. NHS Boards. The committee has already established that, across Scotland, HDL62 is not being followed. 3. SIGN guidelines. The committee is aware of significant governance failings particularly in comparison with NICE which includes details of financial sums paid and associated dates. 5. The forthcoming ABPI register allows any professional to opt out of inclusion. It is also worth repeating that the information provided to the public consultation on this petition failed to highlight most of the issues identified in points 1 to 5 above.